Discover affordable holiday packages to Fiji from Auckland, Wellington, Christchurch and Queenstown. Located only three hours away from New Zealand, this Pacific island getaway is the perfect choice for frugal backpackers, adventurous couples and travelling families. Don't spend hours comparing flights and hotel deals for your trip to Fiji from New Zealand. Instead, combine your flight + hotel in a package booking and build your perfect trip, plus enjoy further savings. Webjet's exclusive holiday package deals include flights to Fiji and hotel bookings for the duration of your stay. It's not hard to see why Fiji is one of the most popular Pacific Island destinations for New Zealanders. 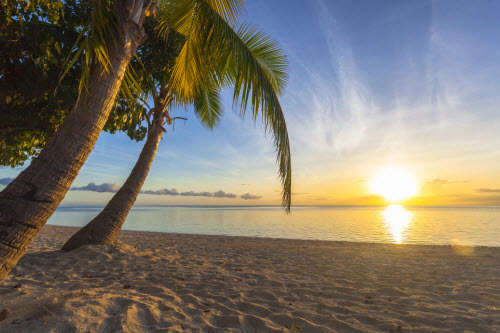 With its year-round sunshine, beautiful coral reefs and laid-back "Fiji time", it's the perfect place for solo travellers, couples and families to unwind. With its excellent tourist infrastructure, it's ideal for travellers that want an exotic island getaway without stepping too far out of their comfort zone. You'll find all-inclusive resorts ranging from five-star brands to remote hideaways on private islands. It's the perfect option if you're travelling as a family with some even letting the kids eat or stay free. For couples, Fiji is the ultimate romantic getaway. It boasts some of the world's best couples-only retreats, set on beautiful islands with private villas and high-end spas. But Fiji is not just a luxury traveller destination. The main islands have affordable hostels that will only set you back NZD 20 per night. Plus if you use local transport and cook your own food, you'll have more than enough money to splurge on the island's exciting outdoor activities. 1. Money: The Fijian dollar is the main currency used in Fiji. You can withdraw cash at the ATMs and pay with credit card at most hotels, shops and restaurants. 2. Electricity: Fiji and New Zealand both use the same connectors so you won't need an adaptor. Fiji uses 240V compared to New Zealand's 230V. The difference is minor, and it will be safe to plug in your laptops and other electrical appliances without a voltage adapter. 3. Entry Requirements: New Zealand citizens with a passport that is valid for at least six months can get a 4-month visa on arrival for Fiji. 4. Language: Fijian is the official language, but almost everyone speaks English. Most of the locals are bilingual, and you won't have to worry too much about a language barrier. 5. Weather: The best time to travel from New Zealand to Fiji is during its shoulder seasons May through to October. Humidity is low, temperatures are cooler but still warm, and the risk of cyclones is at a minimum. If you're planning on visiting Fiji during high season (June to September and December to January), then book your trip well in advance. It's the most popular time for Kiwis and Australians to visit and prices go up 10% to 20%. 6. Getting Around: In Fiji, cars drive on the left-hand side of the road. You'll be able to rent a vehicle if you have a valid New Zealand drivers licence or you can use the larger island's extensive and inexpensive bus networks. 7. Drinking Water: The tap water in Nadi, Suva, Lautoka and other major towns is safe to drink. 7. Health: Unlike other tropical destinations, Fiji is free from malaria, yellow fever and other major tropical endemic diseases.